How credit scores are generated and their role in the U.S. mortgage origination process can be a confusing topic. To help alleviate confusion, I want to take a moment to provide a high-level overview of the role credit scores have in the mortgage lending and automated underwriting process. This is particularly important for conforming mortgages or mortgages sold to government-sponsored enterprises (GSEs), Fannie Mae and Freddie Mac. Fannie Mae and Freddie Mac buy mortgages, pool them together and then sell them as a mortgage-backed security to investors. When Fannie and Freddie buy loans, they assume the majority of the risk if a borrower defaults on their mortgage. And since Fannie and Freddie are backed by the federal government, the risk ultimately falls on the American taxpayers. A tri-merge report includes a credit report and FICO® Score from each of the three major credit bureaus. The credit bureaus (which maintain the consumer credit data) generate, price and sell both credit reports and FICO® Scores to resellers, who then sell a tri-merge report to lenders. 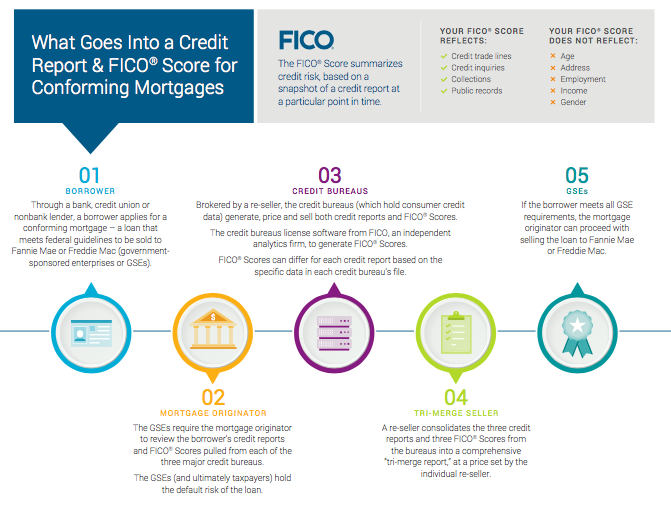 As an independent analytic firm, FICO licenses its software to the credit bureaus to create the individual FICO Scores. Scores can differ for each credit report based on the specific data in each credit bureau’s file. FICO Scores do not reflect age, address, employment, income or gender. While a credit score plays an important role in the mortgage lending decision process, it is not the sole factor. Both Fannie Mae and Freddie Mac’s underwriting and pricing processes incorporate a wide range of information about the borrower and the property in addition to the FICO® Score, including income, assets and importantly, the price of the home and down payment. Investors utilize the FICO Score in order to understand the prepay and default risk within the pool of loans to make investment decisions. Their models are based upon years of historical FICO® Score performance. The infographic below showcases the process. For more information about the role of the credit score in mortgage underwriting visit: http://www.fico.com/independent.